Staining wood is an exciting and fun step in your refinishing process. Staining brings out and enhances the patterns in the wood grain and it unifies an overall color. At this stage your project piece begins to look more finished. Allow enough time to complete this task from start to finish to ensure continuity of color. You have the choice of using either water or oil-based stain, and each offers advantages and disadvantages. Using Oil-based stain creates more fumes and requires more care in use and clean up, but you will attain a richer color and added conditioning properties for dry wood by using an oil-based stain. 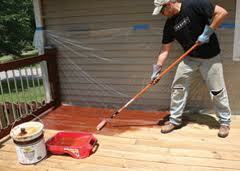 Using a water-based stain eliminates most fumes and requires less care and clean up than oil-based stains. However, using water-based stain does require another step in the process, as you need to apply a wood conditioner to your furniture piece after staining and prior to applying your topcoat. This step, Applying a Sanding Sealer, can also be used with oil-based stains to attain a richer, more consistent color in your finished piece. 2. Sand the wood thoroughly with extra-fine (280-grit) sand paper to remove oil and debris left from the removing the finish and to flatten puffed fibers if you bleached the wood. Sand in the direction of the wood grain. 3. Next, brush away the sanding dust with a small clean paintbrush, especially from joints, grooves and detail areas. Wipe with a clean dry cloth, but do not use a tack cloth. Vacuum or eliminate the sanding dust by shaking out the drop cloth to avoid contaminating the stain. 4. Take the unopened can of stain, turn it upside down and vigorously shake it for several minutes. Open it and stir using a medium-sized slotted screwdriver. Be sure to stir and blend the pigment that settles to the bottom and bottom corners of the can. Wipe the screwdriver with a clean rag, but keep both handy. You will need to continually stir the stain throughout the staining process. 5. Now, you're ready to begin staining. Keep two cloths on hand. One for applying stain and one for wiping. Use stain sparingly, a small amount will cover a relatively large area. 6. Start on an obscure area of your piece, such as the under side of a table, to test the stain color and consistency and to practice your technique. 8. Then, wipe the area with your wiping rag. If you want a darker color leave the stain on longer before wiping. Once you are pleased with your color and technique you can keep going. Work in sections, completing one section before moving onto the next. 9. Apply the stain first to joints, grooves and detail areas using your small clean, dry paintbrush. Wipe the excess stain from this area with your wiping cloth. As you wipe, some stain will migrate to adjoining areas, which you will need to blend as you apply more stain. Always wipe excess stain before adding more. 10. Then apply stain with your staining cloth to the broader, flat areas of this section. Wipe off the excess stain before continuing to the next section. Older furniture often includes different woods joined together. If you see areas or boards that are dramatically lighter, reapply stain and allow it to soak in longer before wiping to even out your color. It's best to complete this before moving to a new section to maintain color consistency. 12. Once you have finished staining the entire piece, allow it to dry thoroughly for 1 to 2 hours. Take into account that the stain will dry more slowly in cooler, damp or humid weather; in this case allow more drying time. Clean your brush and the screwdriver used to stir the stain, as well as any splatters, using paint thinner or water depending on the stain you used. Pour a small amount out into a tin can for cleaning and reseal the container. 13. After your furniture has dried, if you seen any obvious mistake areas, carefully restain the light wood. If you have dark or muddy areas use asmall amount of paint thinner with oil-based stain, or ammonia window cleaner with water-based stain on a clean rag to "rub out" and even the color. Your next step is to finish your piece with a topcoat finish. Refer to the tutorial on Applying a Topcoat for proper instructions. Same thing is being used for the cleaning purpose at my office and I am really interested to see it done. There are many benefits that are meant to be logical and meant to be for cleaning. I've just installed iStripper, and now I can watch the sexiest virtual strippers getting naked on my taskbar. The hardwoods are the most popular and widely used material for the purpose of flooring. They are easy to maintain and also very much affordable. The only thing to keep in mind is to timely repair any damages and the need for proper refinishing to ensure their longevity. Also, according to your surrounding atmosphere, decide whether to apply oil or water-based stain to get an elegant look for your floor. It is always better to make use of oil-based stain as it lasts longer as well as easy to apply on the wood floors by yourself.